1. Read your Bible daily. Those who grew up in Sunday School will remember this one. Every Sunday the class was asked to raise their hands if they had read their Bibles everyday in the week before. We were always so excited when we could raise our hands. Since it is the beginning of the year, you might look for a schedule of reading your Bible through in a year. This is a good way to read your Bible through and have daily Bible readings. 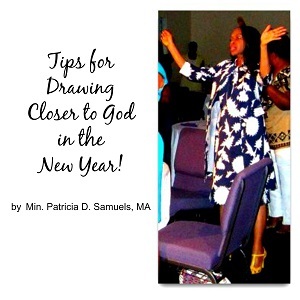 It will also cause you to draw closer to God because you are learning more about Him through his Word. 2. Pray daily. You might start the day with something like, “Lord, thank you for waking me up this morning. Please show me what to do with this day.” Or you might spend the time you commute to or from work in prayer. This is especially great if you pray in the Spirit. You’ll be infusing yourself with power to have a great day at work or a great evening at home. Whether in your native tongue or an unknown tongue, praying will draw you closer to God because you’ll be communicating with Him. 3. Spend time in Praise and Worship. Listen to some praise and worship music or sing some of the songs you’ve learned in church. This isn’t limited to the popular songs of the day. You could also sing the “old” hymn book songs. The Bible says God inhabits the praises of His people. That is, He comes to live in our praise. Doing so will draw you closer to Him. If you make these things a part of your lifestyle, you’ll find that you have a very good relationship with the Lord and continual answers to life’s problems. Happy New Year! Here’s to getting it off to a great start!